CHICAGO — Brooms did the trick for Field Museum scientists against an angry peregrine falcon mother. As part of the Chicago Peregrine Program, scientists band peregrine chicks to keep track of their numbers. This week, one peregrine mother wasn't too pleased as a handful of researchers banded her young. Protecting themselves with brooms, the Field Museum scientists kept the mother at bay long enough to band the three chicks on a city dwelling in the Ukrainian Village area. The scientists didn't want to give away the exact location. Josh Engel, a researcher at Field Museum, took the photos of the mother bird flying at his co-workers. On his Facebook page, he described the action as "as close to war zone photography as I will ever get, photographing biologists getting attacked by a female Peregrine Falcon while taking her chicks out of the nest for banding." "Adult peregrine falcons, particularly the females, can be quite aggressive in defense of their young," said Mary Hennen, director of the Chicago Peregrine Program. "They commonly fly very close to the bander, and inverted brooms are used as a means of blocking a potential peregrine’s strike. ... Thus brooms are safe for the falcons because if the birds do strike, their feet easily pass through the soft bristles. Yet at the same time they are protecting the scientist by keeping a distance between the birds and people." Hennen said a small amount of blood is collected from each chick, which can later be examined for blood-borne pathogens or simply to look at DNA. Chicks are typically banded when they are as physically big as they'll grow but don't have their flight feathers yet, Hennen said. The bands are aluminum and wrapped around a chick's leg like a blanket. 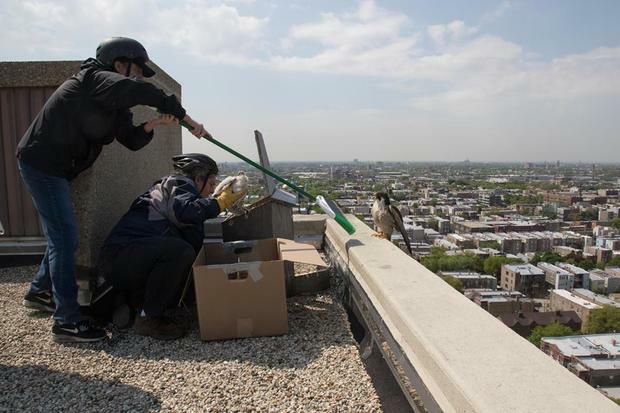 "The utmost care is taken to ensure both the safety of the Peregrines, adults and chicks alike, and personnel," Hennen said. Earlier this spring, the Chicago Peregrine Program activated its live webcams at peregrine falcon nests throughout the city and suburbs. The webcams are available through June, when the birds are nesting. Neighborhood nests with webcams include ones in the South Loop, at UIC, at Millennium Park and near Belmont Avenue and Addison Street in Lakeview. In recent years, the raptors have been spotted nesting on a balcony in Lakeview, at the University of Illinois at Chicago and at water-intake islands 2 miles out in Lake Michigan. They even attacked a great horned owl off the Rogers Park lakefront. Peregrines are the fastest-flying bird in the world, as they can dive at 200 miles per hour, eating birds they capture — like pigeons — in mid-flight. The Field Museum's Chicago Peregrine Program monitors 29 peregrine territories, and in 2015, 20 pairs attempted breeding, and 15 were successful, according to the group. It's been a remarkable comeback for the bird, which was federally recognized as endangered in 1973 but was taken off the list in Illinois last year. Though removed from the Illinois endangered list, they are still protected under the Migratory Bird Treaty Act. A turning point for the bird came in 1972, when the use of DDT insecticides was banned. The agrochemical had caused peregrine egg shells to thin, preventing babies from forming. It wasn't until 1986 that the birds could be found again in Illinois, and 46 pairs were released in the next four years. In addition to the DDT ban, their recovery can be attributed to their adaption to cities, and their protected status as an endangered and threatened bird, Hennen said. The program monitors the Illinois population and places ID tags on the birds.